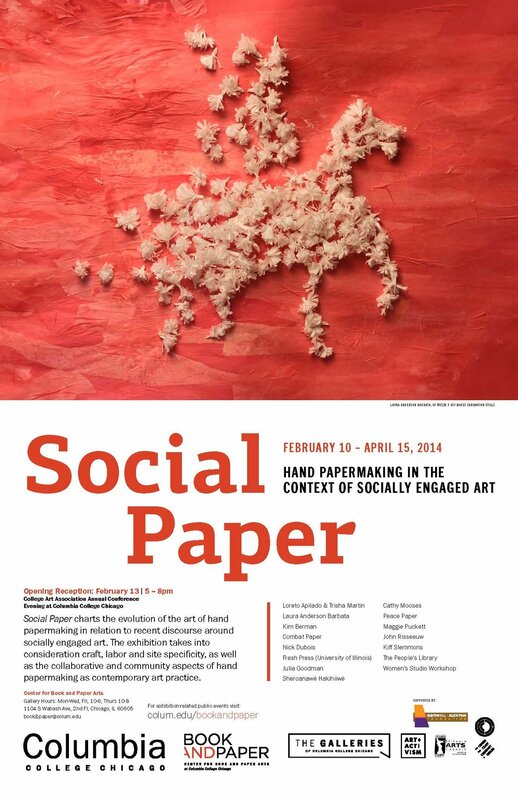 Social Paper: Hand Papermaking in the Context of Socially Engaged Art was an exhibition co-curated by Jessica Cochran and Melissa Potter that charted the evolution of the art of hand papermaking in relation to discourse around socially engaged art. Social Paper: Hand Papermaking in the Context of Socially Engaged Art was an exhibition co-curated by Jessica Cochran and Melissa Potter that charted the evolution of the art of hand papermaking in relation to discourse around socially engaged art. The exhibition addressed craft, labor and site specificity, as well as the collaborative and community aspects of hand papermaking as contemporary art practice. A digital copy of the catalog is available online or PDF download.